160 Years Ago in 1855 – On Saturday night [6th Oct], a fire was discovered in large barn, which was full of barley, belonging to Mr. Brooks, of Lavendon Grange. This was all burnt; but, fortunately, the wind was in good direction to prevent further mischief. Both are supposed to be the acts of an incendiary; but at present no clue has been discovered of the offenders. 150 Years Ago in 1865 – Ornithology. — Shot by John Perry, Esq., of Lavendon Mills, Olney, Bucks., the Eared Grebe. (Podiceps auritus, le Grebe oreillard of Temminck.) This rare and singular bird’s peculiarities are, when resting on the land it lies at full length and shuffles along like a seal, pushing itself onward by striking the ground with its feet. Ill adapted for the land, the Grebe is admirably adapted for water: it swims well, owing to the flatness of its body, and when diving in pursuit of its prey uses its wings to add to its velocity. The specimen has been sent to Mr. Mantel, Mill-street, Bedford, to be preserved. 140 Years Ago in 1875 – Heavy Floods. —As a natural result of the heavy and continuous rainfall of Saturday night last the Ouse became swollen to an unusual degree. During Sunday night especially the rise was so rapid that the lowlands lying on each bank of the river were speedily covered to a considerable depth. An immense volume of water came sweeping down from the upper part of the river, and live stock, that happened to be out, became exposed to great peril. Mr. Parris, of Lavendon, had a number of sheep surrounded by the water, and before they could be rescued, seven were drowned. At Lavendon Mills the river rose very rapidly, and the water soon entered the lower storey of the building, doing considerable mischief. During Monday night the waters began to abate, and are now gradually subsiding. LAVENDON.—Shocking Accident.—On Tuesday last, a man named John Holmes, was working with a thrashing machine on Mr. Church’s farm, in this village, when in some way his leg became entangled in the machinery, and was torn completely off. The poor sufferer was at once conveyed to the Bedford Infirmary, and on his arrival there was in a most precarious condition. 120 Years Ago in 1895 – In the parish of Lavendon, Bucks., it appears that the total number of persons in receipt of relief is eighteen, and their ages average seventy-eight years—nine of them averaging eighty-two. 80 Years Ago in 1935 – Lavendon celebrated their Church Patronal Festival last week in the Ambulance Hall. The dances at the beginning were not very well attended, but on Wednesday Billy Dooley and party (conjurers and variety entertainers) attracted a large audience. This must have been gratifying to the organizers. On Thursday a Girl Guides’ camp fire, and songs and recitations by the school children were given. There was a large audience. Another dance was held on 4th October. Mr. Robbins was M.C. To wind up the week there was a tea, social, and dance on Saturday night, the arrangements being in the hands of the Rector and the Church Council. Any profits were to be given to the church restoration fund, but it is regrettable that there were none this year. Lavendon Parish Council – It was decided to write to the County Council asking if a suitable sign could not placed at the corner of Castle Road showing the way to Northampton, so many motorists went the wrong way. WORKS FOREMAN KNOCKED DOWN – On 17th October while watching the men at work on the telephone cable in Northampton Road, Mr. G. Mortimer, the foreman, was knocked down by a passing motor and received severe wound in the head. He was taken into Mr. F. Ingram’s house where he was attended to by the doctor and was later removed in the Olney Motor Ambulance to Bedford County Hospital. Mr. Mortimer was discharged from the Hospital on Tuesday. 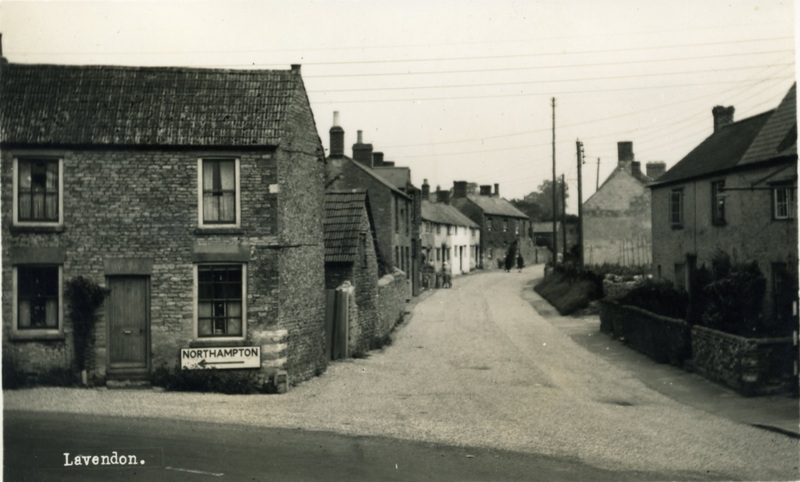 70 Years Ago in 1945 – “BORROWED” BUS “TOTAL WRECK” AFTER CRASH – A MOTOR-BUS taken from a parking-place at Olney was later found on the Olney – Lavendon road upside down and a “total wreck.” As an outcome of this four soldiers were summoned at Newport Pagnell Magistrates’ Court…. Millward is an Olney man who was home on leave. The other three were from the camp at Brayfield House…. Evidence was that the incident followed a dance at Olney. Inspector W. Merry said that in the early hours of Sunday morning, Sept. 23, the bus was found upside down on the Olney-Lavendon road. It was a total wreck. Nathan was driving the vehicle when it met with an accident through the driver taking a right-hand bend at too great a speed. It went over the grass verge, crossing two or three gulleys and mounted a heap of stones finally coming to rest upside down in the centre of the road. Prior to the accident the bus had been driven by Millward. The Inspector understood that the total damage to the vehicle was £500. The speedometer had jammed at 55 miles an hour. It was also stated in evidence that the Olney soldier gave the other a joy ride to Emberton and round the clock tower. Then he stayed behind at Olney and another man drove the bus. It was said that he lost control when it went on the grass verge, mounted a heap of stones, and crashed. One of the defendants said they were under the influence of drink. ALLEGED DAMAGE BY EXPLOSIVES Lavendon Parish Council, having been instructed by parishioners to protest to the War Office regarding damage being said to be caused by the demolition of explosives in Lavendon and district, duly placed the matter in the hands of Flt- Lieut. Aidan Crawley, M.P., who raised it with the Under-Secretary of the War Office. The Council has now been informed that, as far as the British Army is concerned, these operations will cease forthwith. As regards compensation for alleged damage, an officer of the War Damage Commission has visited the village to assess the amount of repair and cost that might be necessary. A letter has been addressed to the United States Air Force authorities, requesting them to do the same. Posted on Saturday, 3 October 2015 by Editor •	This entry was tagged Timeline. Bookmark the permalink.